The effort put in on this trail will certainly be rewarded by the many spectacular views of the Vaud Alps and Mont Blanc. This trail starts at the Villars Sports Centre. Join the Col de la Croix road then take the path off to the right at the entrance to the forest near Les Pâquiers. You’ll quickly come to a stream. Follow it until you get near Coufin, then start climbing to the Col de la Croix alpine pastures. As you pass near the Col de la Croix, take a break to admire the gypsum pyramids, then head towards the hamlet of Ensex and finally to Bretaye. You can return to Villars by the footpath or on the cogwheel train. There’s free parking (10 hr maximum) near the Villars Sports Centre. Tennis fans can use the 3 indoor carpet courts all year round and the 3 outdoor synthetic clay courts in the summer. 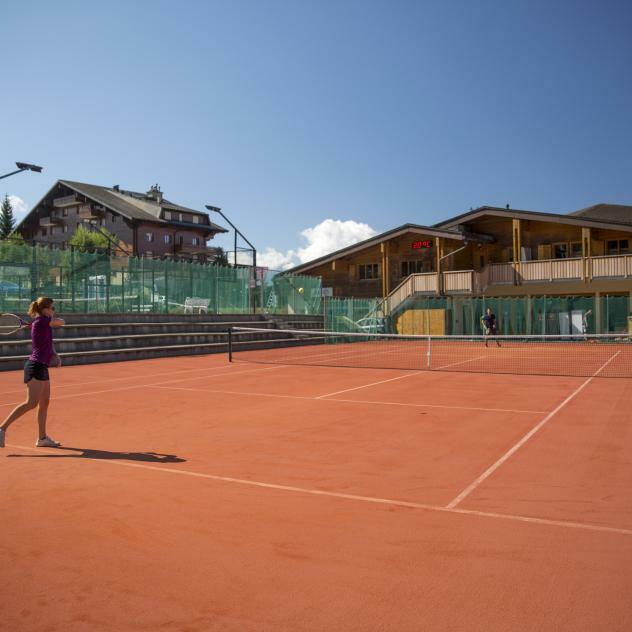 The courts are in an ideal location a short walk from the Rochegrises train stop and a few hundred metres from Villars railway station.